European Union Foreign Minister reaches out to Jewish groups after compromising with Israel on boycott Tuesday night. 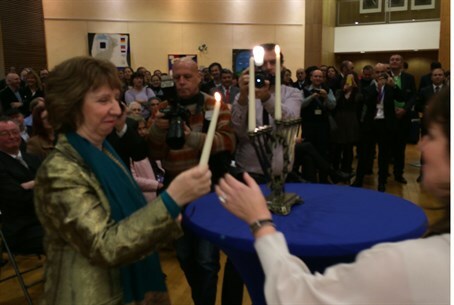 Catherine Ashton, Foreign Minister for the European Union (EU), spoke at a Hannukah ceremony at the European Jewish Community Center (EJCC) Wednesday night, in a bid to reach out to Jewish and Israeli communities. The ceremony was conducted by the European Jewish Agency - and Ashton was the guest of honor. The move follows talks between Israel and the EU Tuesday night, in which the two international bodies compromised on Israel's involvement in the Horizon 2020 scientific collaboration project. After extended phone conversations between Ashton and Justice Minister Tzipi Livni, they each agreed to publicly maintain their stances on Jewish presence over 1949 Armistice lines, but still collaborate for the sake of the project. "Our thoughts are with the Jewish people everywhere, and no more so than the people of Israel," Ashton concluded, adding that Livni is a "friend" who added to the day's celebrations with news of the compromise. In her speech, Ashton did not directly reference this week's deal between the West and Iran, but stressed the importance of both peace and security. "In order to have peace, we need security; and in order to have security, we need peace," she stated. "The lighting of candles plays an important part in shining the light of hope across the world." Regarding the holiday itself, Ashton noted that the lighting is "a moment to remember family, tradition, values, and culture." Ashton emphasized that the European Union "believe[s] in the freedom of all peoples to be who they are, to be of the race, faith, religion they want to be." The statement may be directed at outrage following repeated reports of a vast upswing in European anti-Semitism, as well as the public efforts of Swedish Jew Annika Hernroth-Rothstein to protest against laws against kosher slaughter, circumcision, and other Jewish rituals.